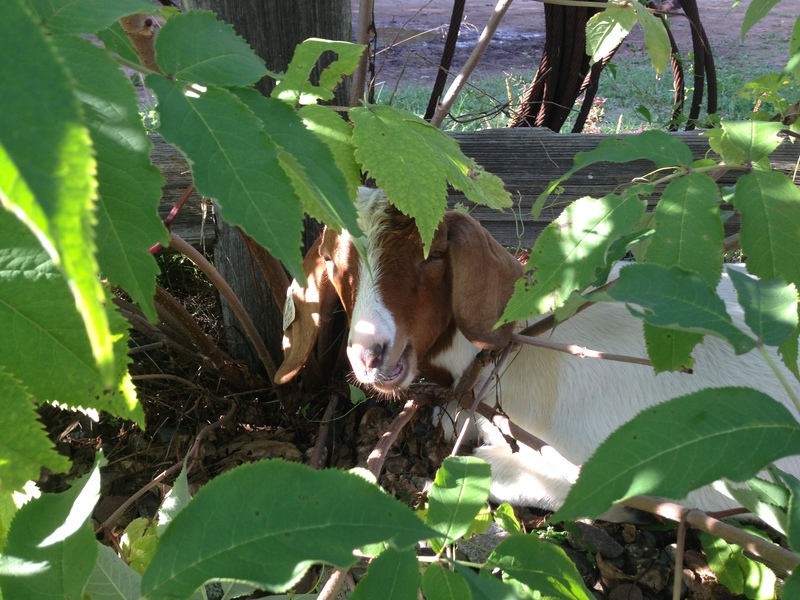 Currently, we are not taking orders for goats as we adjust the location and breeding stock for our goats. We have a small herd of Boer-Myotonic (Fainting Goats) goats on our farm. We started with six does in 2013 and our herd has slowly grown. In 2017 we decided to only save the original six since they were creating problems in our current pasture system. Hopefully we will put up a new fenced area for them in 2019 so that they will be separate from our chickens, pigs and cattle. When we are able to do that, we will then grow our herd again. The females kid (i.e. give birth) in late May-early June. We have had goats for butchering since 2014 and hope to keep up the trend as the years go by. If you are interested in buying goat meat, please contact us. Our goats live out on pasture throughout the year. When the snow gets too deep for them to forage for their food we provide them with hay. Thus they are getting a diet that their bodies were created to consume (i.e. grass and leaves). If our hay resource proves to not have enough calories for the goats we will supplement with some organic grains., however, we have not had to do this. We supplement their mineral intake with salt and kelp meal. We do not medicate our heard. If an animal does have problems we will medicate it and sell it to a farm that is not concerned with medicating their animals. Our goal is to develop the genetics for our herd in a way that produces healthy, parasite resistant animals. If we were to rely on medications such as antibiotics and dewormer to take care of our animals, then those genetic traits that predispose animals to sickness and parasites will stay within the herd. Furthermore, the more medications we use the more likely we are creating drug resistance within the parasite and germ communities. Finally, our cost of production is reduced by not having to regularly deworm our heard. Thus we find that the more difficult path of improving our herd genetics is worth taking over the easier path of improving pathogen genetics through medicating. We will not have any goats available next year for butchering. This weather is 100% grass-fed and very tasty. They have a rich, solid flavor and would fall somewhere in between lamb and venison for taste. We are offering them at $5.00/lb. based on hanging weight. They will range in weight from 25-50 lbs. You will be able to pick the size of animal you want. $50.00 deposit per animal. Please call ahead to make sure we’ll have one available for your next feast.